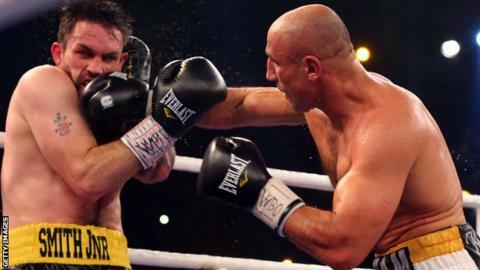 Paul Smith will have another chance to fight Germany's Arthur Abraham in a rematch for the WBO super-middleweight title on 21 February in Berlin. The 32-year-old Liverpool fighter lost to Abraham on a controversial points decision in Kiel last September. Many of the rounds were close and Smith believes he has the ability to dethrone the two-weight world champion. "I'm not going into this fight hoping and believing I can beat him because I know I can," he told BBC Sport. "Although the fight was a loss on my record, I feel I pushed him close and I won the fight. I feel like I've proved myself as a world champion already." During the fight Smith unsettled Abraham, who has a 41-4 professional record, as he caught the German veteran with his right hand. However, the three judges at ringside returned two scorecards of 117-111 and one of 119-109 in favour of Abraham. Smith added: "Whether he will admit or not, he knows when he got into bed after that fight, the same as I do, that he got pushed and it's the closest he's been pushed in a long time or he knows that he lost. "Either way, he's got to live with that and it will spur him on in the gym to make sure he's fitter and stronger. "He says he's going to knock me out but he said that last time and he's going to have to be in the shape of his life to do that." Smith is confident that, if the fight goes the distance, he won't be overlooked by the judges for a second time. "In my opinion, lightning doesn't strike twice," said the British super-middle weight champion, who has a a 35-4 professional record. "The WBO are a very competent organisation and I know they base themselves on integrity and loyalty because it's written on the belt. They wouldn't send another three bad judges to Germany because they know this fight is going to be scrutinised. "I'm 32 but I'm not an old fighter who's had so many hard fights and can't get any better. The story of my career is that I've been under-achieving and I've still got a lot to give." British heavyweight David Price, who pulled out of his scheduled fight with Emiliano Zarate last weekend with a bicep injury, is also on the bill at the O2 World Arena in Berlin.